The first persons that were honoured by the Christian Church as saints were their early martyrs. Later also other people were recognised as saints upon approval by a local bishop. In medieval times, the act of canonization by which a deceased person is declared to be a saint was reserved to the Holy See as a conclusion of a long process requiring extensive proof on the candidate's exemplary and holy life. 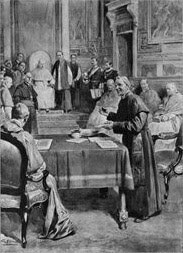 In order to formalise and to improve the canonisation process, Pope Sixtus V. established the Office of the Promotor Fidei in 1557, popularly known as “Advocatus Diaboli”, who is a canonical lawyer whose task is to make the argument against canonization of a candidate by looking for weaknesses in the evidence for the miracles attributed to the candidate. From a more global point of view, the person taking the role of an “Advocatus Diaboli” assesses the quality of the original argument and, by this, either improves or abandons the original position. Now, within the more profane context of European patent politics, the Statement of Position by the Advocates General regarding the request of the EU Council for an opinion of the Court of Justice of the European Union (CJEU) on the planned European Patent and the European and EU Patent Court (EEUPC) has made publicly available. While the Statement says that it has been presented already on 2 July 2010, the general public had to be patient until 19 August 2010 when the eagerly awaited Advocates General’s Statement has finally been found and published on the EPLAW blog (see Opinion 01/09, Statement of Position, originally in French or informal English translation). It is amazing how such important documents of EU authorities are “published” in a hide-and-seek way so that it takes another six weeks to find them on some EU internet servers. I have to agree with a related remark on the IPJur blog, according to which these are “childish games played by interested circles inside of and close to the EU Council in a futile attempt to withhold such important documents from the eyes of the general public”. Anyway, much like an Advocatus Diaboli in canonical law, the Advocates General identified the weaknesses of the European Council’s Draft Agreement of 23 March 2009 (Doc 9076/09), and defined the conditions under which “canonisation” of the proposed European Patent Court System to the heavens of EU treaties may be obtained. The possibility of an appeal on decisions of the EPO to the European Court of Justice (as especially emphasised by the Advocate General). However, Ms Kokott’s Statement also emphasised that an international body outside the institutional scope of the EU would, however, not per se be incompatible with EU treaties and especially points to the fact that for achieving compatibility an effective judicial control has to be ensured by an independent court observing EU law and being authorised to, if appropriate, refer a preliminary question to the CJEU. 117. As pointed out by Spain in particular, it is not ruled out that a company may be summoned in law, before a local or regional division of the PC, in a language other than the official language of its country of origin. This aspect was also debated during the hearing before the Court. 121. The [linguistic] situation is clearly more delicate, however, when the country where a company must be assigned does not participate in any local or regional division of the PC Court of First Instance. In such a case, the dispute would be brought before the central division of the PC Court of First Instance, and the language of the proceedings would be that of the patent, namely German, English or French. Consequently, a company may be summoned in law in a language in whose choice neither its country of origin nor the country where it carries out its commercial activities has participated. [...] [T]his linguistic system appears to be unacceptable with regard to observance of the rights of defence. 68. Secondly, one should check whether it would not have been necessary to include in the competences of the future PC a section on administrative proceedings. These proceedings concern in particular appeals against the EPO filed by companies making unsuccessful applications for the granting of patents, as well as appeals filed by third parties unsuccessfully opposing the granting of a patent. 71. In fact, the decisions of the EPO concerning patents can only currently be reviewed by the internal chambers of appeal created within the EPO, excluding any judicial appeal before an external court. There is no possibility of the European Court of Justice ensuring the correct and uniform application of Union law to proceedings taking place before the chambers of appeal of the EPO. On this important point, the legal situation concerning Community patents is therefore fundamentally different from that concerning Community trade marks. 72. The European Union should not either delegate powers to an international body or transform into its legal system acts issued by an international body without ensuring that effective judicial control exists, exercised by an independent court that is required to observe Union law and is authorized to refer a preliminary question to the Court of Justice for a ruling, where appropriate. 74. However, […] administrative proceedings against decisions of the EPO […] do not appear to play a role either in the draft agreement setting up the EC or within the scope of the European Union’s accession to the EPC. Comments: With respect to the future developments of this matter, the Kluwer patent blog takes the rather pessimistic position that, if the Court follows the Advocates General’s Statement of Position, a unified patent litigation system including a EU patent could possibly not be achieved in the near future, due to the requirement to involve the CJEU in any EU patent litigation system and the inability of the system to limit the number of working languages. The IPJur blog adds to the discussion that, in view of the many objections by the Advocates General, it presently is the most realistic scenario that the CJEU’s final decision closely resembles the Advocates General’s Statement, in which case a re-drafting of the proposal of the EU Council would be most painful with regard to the language issue and the requirement that the EPO Boards of Appeal “do not any longer see the blue sky over their heads”. The “observation of EU law” requires a provision that EU law prevails over the wording of an EEUPC agreement and that the EEUPC have to take the entire EU law into account. The required “remedies” may be provided by a provision to allow the European Commission and EU member states to file an appeal in the interest of the law with the CJEU. Improving the “linguistic system” would only require that parties may obtain translations of documents in the file of the Central Division. Sufficient “judical control” would be obtained by (i.) a new EPC rule to the effect that the Boards of Appeal must refer questions on EU law to the CJEU and (ii.) a provision that the EU Commission and EU member states can file an appeal in the interest of the law with the CJEU. Mr Steenbeek also stresses that, beyond the Statement of Position and the coming Court Opinion, it is the political reality that only about 50% of the EU member states are positive about the EEUPC approach, so that it may be the most straightforward approach to form something like a “coalition of the willing” to at least achieve an agreement between those EU member states that are enthusiastic about a unified patent litigation court system in Europe. Conclusion: The Statement of Position of the Advocates General is clearly a setback for the EEUPC project. The national views on the language regime has proven once again to be a major obstacle for its implementation, while the required judical control over EPO decisions appears solvable in an administratively way. In the near future, most likely before the final opinion of the CJEU, we will definitely obtain a reaction of the current Belgian presidency and the coming autumn meeting of European patents judges will surely comment thereon as well. Update: Meanwhile, the Chartered Institute of Patent Attorneys (CIPA) has issued a press release concerning the Advocate's Generals negative Statement, in which CIPA urges the CJEU to take a more pragmatic view on legality of proposed European patent and patent courts (see comments on IPKat blog). Further, the PatLit blog reports on an article on ScienceBusiness in a similar cadence, according to which "Belgian Presidency pledges to press ahead on patents".